Warfarin or dabigatran for atrial fibrillation? I have a patient currently taking warfarin for atrial fibrillation (AF) and aspirin for embolic stroke prevention (secondary to AF). She was discharged from hospital on both medications a few years ago. She has a normal heart and is keen to go onto dabigatran to avoid the hassle of getting regular INR tests done, because she is elderly, lives rurally and prefers to avoid driving where possible. I have searched for information on what to do in this situation and have been unable to find specific recommendations. I know the aspirin raises the risk of a major bleed with both medications. Could the aspirin be stopped? This question raises several issues and is likely to be a common scenario in managing patients in primary care who require antithrombotic treatment. Firstly, it is unclear why the patient is taking both aspirin and warfarin as it appears that they are both being given for the same indication. It is also unclear if the patient has had a previous cardiovascular event, but we can presume that the medicines are being given for primary stroke prevention. We also presume that the AF is non-valvular and permanent. The risk of stroke in people with AF can be calculated using assessment tools such as CHADS2, CHA2DS2-VASc and HAS-BLED (see here for these tools). If the CHADS2 score is ≥ 2, the patient should be anticoagulated. If the CHADS2 score is less than 2, CHA2DS2-VASc can be used to further evaluate risk. Anticoagulation is recommended for people with a CHA2DS2-VASc score ≥ 1. HAS-BLED can be used to calculate the risk of bleeding when considering anticoagulant use. A score of ≥ 3 indicates a patient who may be at high risk of bleeding complications. This is of particular significance in the present scenario as the patient lives in a rural area, therefore access to medical services is likely to be delayed if a bleeding event did occur. What is her stroke risk? 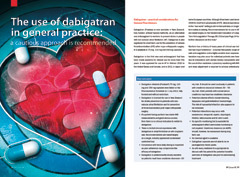 If an anticoagulant is the appropriate choice, should this be warfarin or dabigatran? Other factors such as weight < 60 kg, age > 80 years, and creatinine clearance 30–50 mL/min, which means that dabigatran must be used with caution, may help with decision making. Therefore in summary, it appears that this patient is unlikely to require both aspirin and warfarin, so at least one medicine should be stopped, depending on risk of stroke. If the patient is stable and able to attend for INR monitoring, consideration should be given to remaining on warfarin, especially given that a bleeding event carries more risk to a patient in a rural area with dabigatran, in which there is no antidote able to be carried by the closest medical professional (such as vitamin K for warfarin). If the decision is made to swap to dabigatran, ensure that INR is less than 2, check creatinine clearance and ensure that the correct dose is given for the patients age (i.e. < 80 years: 150 mg, twice daily, ≥ 80 years: 110 mg, twice daily).